Sophie, the famous giraffe, has been part of babies’ lives for more than 40 years. Sophie looks, and is made, exactly as she did when first created in 1961. Every Sophie built involves a process of more than 14 manual operations. A European sensation, Sophie has only become available in the States in recent years. Slender, flexible, and soft -- your baby can squeeze and chew her in complete safety. Made from 100% natural rubber and food paints -- free of phthalates and BPA. Lovable and amusing, she makes a happy sound when her body is squeezed stimulating baby's hearing and helping him/her to understand the link between cause and effect. She is perfect for soothing baby's sore gums when teething. 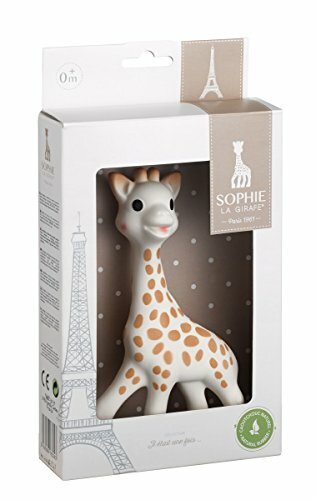 The singular scent of natural rubber from the Hevea tree makes Sophie very special and easy for your child to identify amid all her/his other toys. Height: 7 inches or 18 cm.